The Mediatrix VoIP Adaptors give you the ability to easily connect analog telephones, modems, point of sales, and fax machines to Voice over IP (VoIP) Networks. 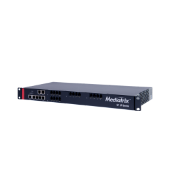 The Mediatrix S7 Series ATA offers you the ability to seamlessly connect all analog equipment to a hosted or on-premise IP-PBX. It is the ideal solution when connecting traditional PBXs and phones to an IP core network so you are not impacting your current customer base. The Mediatrix S7-LP Series is a high-performance ATA that deploys cloud telephony services for demanding wiring conditions and over-voltage exposure applications. Providing secondary over-voltage protection and enhanced power feeding to meet requirements for large buildings and outdoor environments. The Mediatrix 4102 interconnects analog phones, faxes, and modems to SIP-based systems. It features 2 FXS Analog Ports and allows you to connect up to 4 Voice Channels. This is the perfect ATA which allows operators to shorten deployment time and ensure a highly secure environment to enable cloud telephony services into branch offices and SMBs.